When you hire JOHN CALVO as your Broker/Realtor, expect competence, experience and professionalism on your transaction. "My goal on your real estate transaction is to make your experience stress-free and a win-win situation. I try to make the difficult and complex process of selling and buying real estate smooth-sailing on your part." • RE/MAX "Hall of Fame" award winner for consistent top production with the RE/MAX system for 14 years. San Fernando Valley, San Gabriel Valley & the Foothills. • Lifelong resident in Los Angeles, California (Los Feliz area). A true "Neighborhood Specialist!" 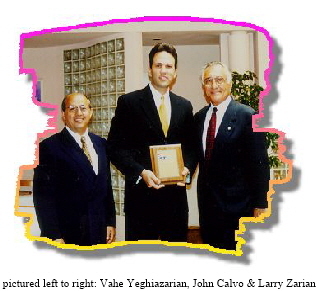 Throwback to 1997 - John Calvo is presented the coveted RE/MAX "100 CLUB" award by broker, Vahe Yeghiazarian and ex-Mayor of Glendale, the late Larry Zarian. The RE/MAX "100% CLUB" award is awarded to the top 5% of RE/MAX agents in the United States.